The Rebecca Motte Room on the first floor, or Exchange Floor, of the Old Exchange and Provost Dungeon is the formal meeting place for the Rebecca Motte Chapter of the National Society of the American Revolution. 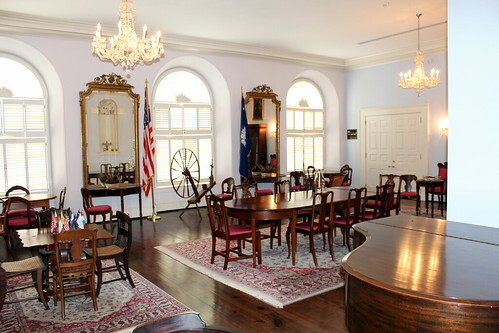 The room and chapter are named for Rebecca Brewton Motte, the Revolutionary War heroine who famously let Generals Francis and Light Horse Harry Lee set her plantation house on the Congaree aflame after the British appropriated it as a fort during the Revolutionary War. The ladies of the Rebecca Motte Chapter, organized in 1895, have been meeting here since 1921. For their meetings, each lady would bring a chair from home, and the current collection, ranging in date from Late Georgian to Colonial Revival, continue in use today. The collection also include two pier mirrors, c. 1850, of Continental origin that once belong to Queen Wilhelmina of the Netherlands and purchased by the chapter in 2006.